This morning dawned cold and clear at Starveall, with some cirrus clouds drifting above and a soft light on the jagged Mt. Starveall itself. We knew that some weather was supposed to blow in throughout the course of the day, so we made sure to get moving quickly in the morning to try to get as far as we could. 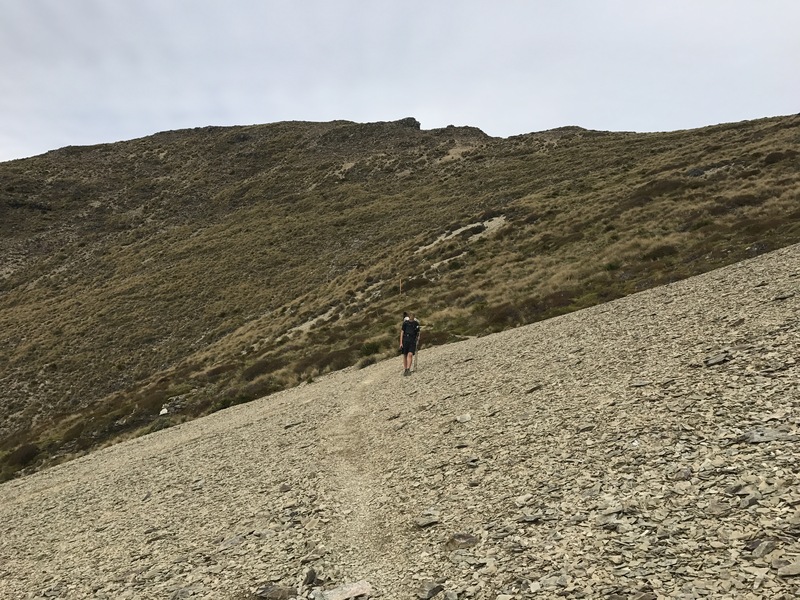 The very first section was a traverse across a slate scree slope to a ridgeline we followed all the way up to the top of Mt. 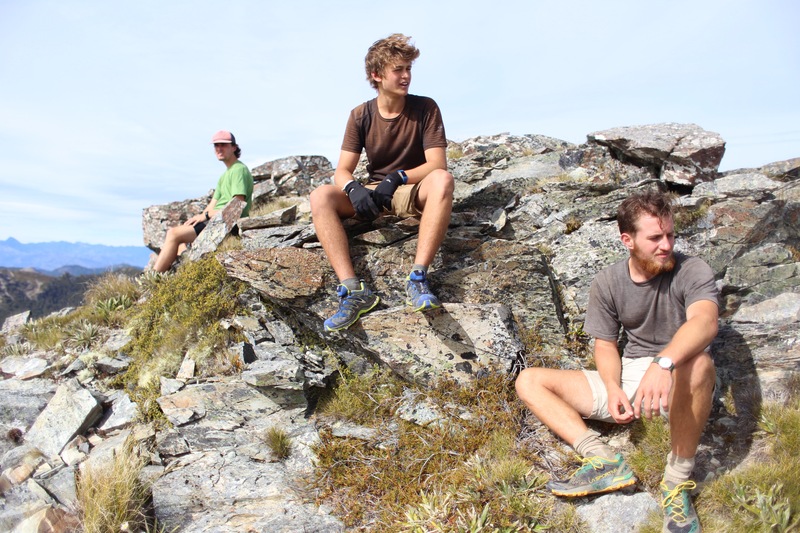 Starveall (the actual summit was just off trail so we dropped our packs to jog up to the summit cairn). 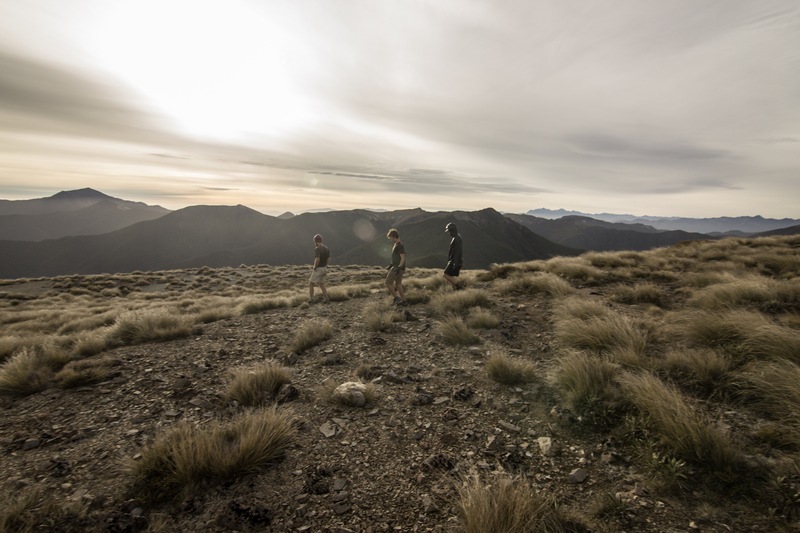 This was our first taste of Richmond Range alpine glory – for fifteen minutes or so we stood in the 7 AM bone-chilling wind awed by the full circle views of countless other Southern Alps peaks and the exposed, primal landscape of sharp rock and dry yellow tussock, and hungry for the rest of the day, which promised almost entirely above-treeline hiking and at least four or five more 1500 meter summits. Down from the top of Starveall we followed a ridge into a scrawny, exclusively beech alpine forest, sparse and open, colored with the rich green of the moss on the ground and the small clustered leaves arranged like shelves and roof, the faded sea green of the hanging moss and lichen on the trunks, and the white and gray patches of the bark itself. One of the coolest types of forest so far. (Insert pic). 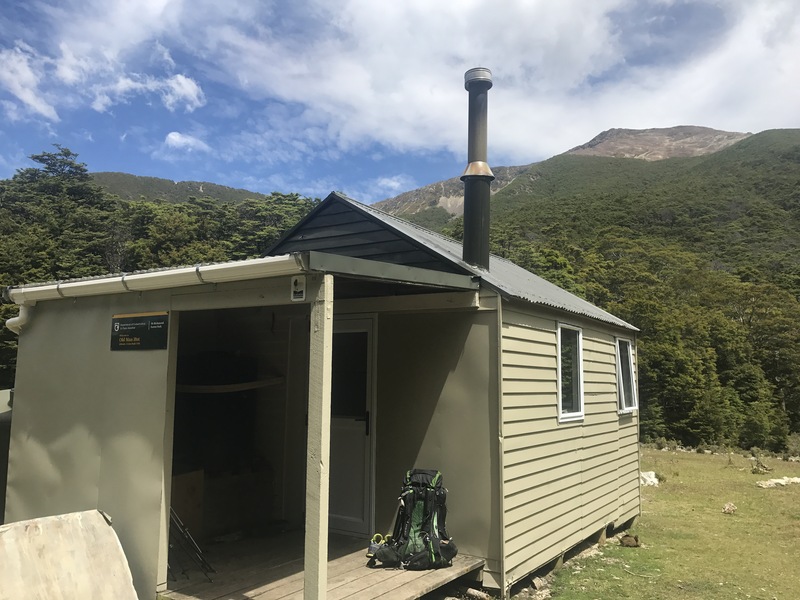 Out of the forest and up from the saddle we climbed into view of Slaty Hut, another 6-bunk hut placed below Slaty Peak. It took us about two hours to make it there, a typical two thirds of the DOC time estimate. Just as we broke over the hill before the hut a small blue and white helicopter took off from the hut’s helipad – wondering whether it may have been a rescue we asked a hiker who was making breakfast in the hut, and learned that there had simply been a problem with the tap on the water tank, so DOC had to call in the heli-plumber to fix her up. 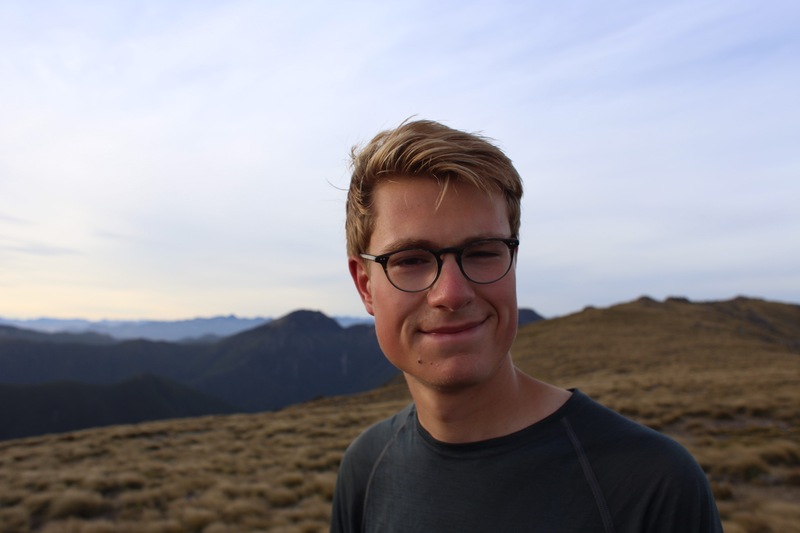 At 9, after a little bar break, we continued our day, which was quickly shaping up to be possibly our favorite to date, with another traverse across a scree slope and up to a ridge which we followed up to a 1538 meter peak just beside Slaty Peak. From here we started to see more directly South down the main Alps backbone, and spied some snow-covered peaks which we estimated to be down around Arthur’s Pass. 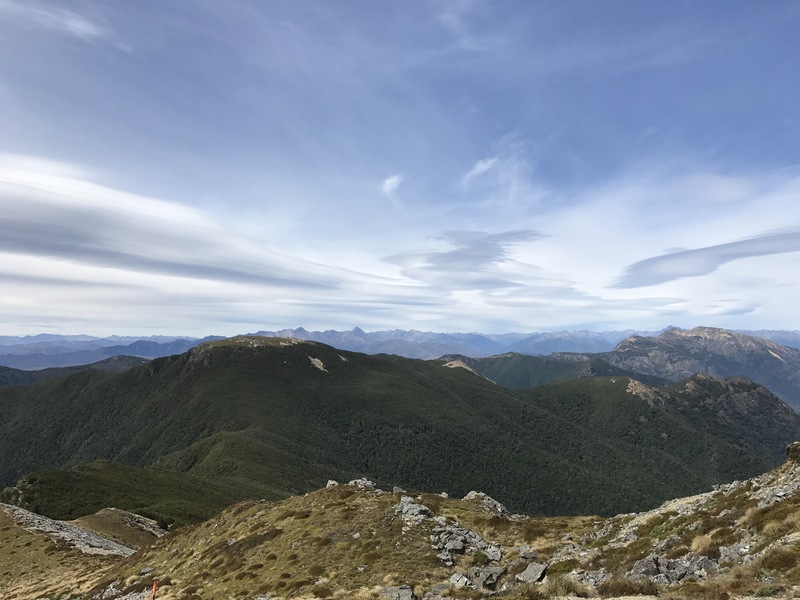 For this whole Slaty Hut to Old Man Hut section I think we stayed above 1300 meters, with continuous views from Sea to Summit (hyperlink their site, get sponsurship muny). At another packs-off offtrail summit excursion we spied some goats and talked about pizza before we had to get moving again for warmth. Our final high point was Old Man, at over 1500 m, up to which may have been the steepest (but not too long) climb of the trip, and after which was a thin steep cliffy ridge with no track but small sparse cairns that kept taking us up and down before eventually spitting us into the forest just before the junction with the Old Man Hut access trail. 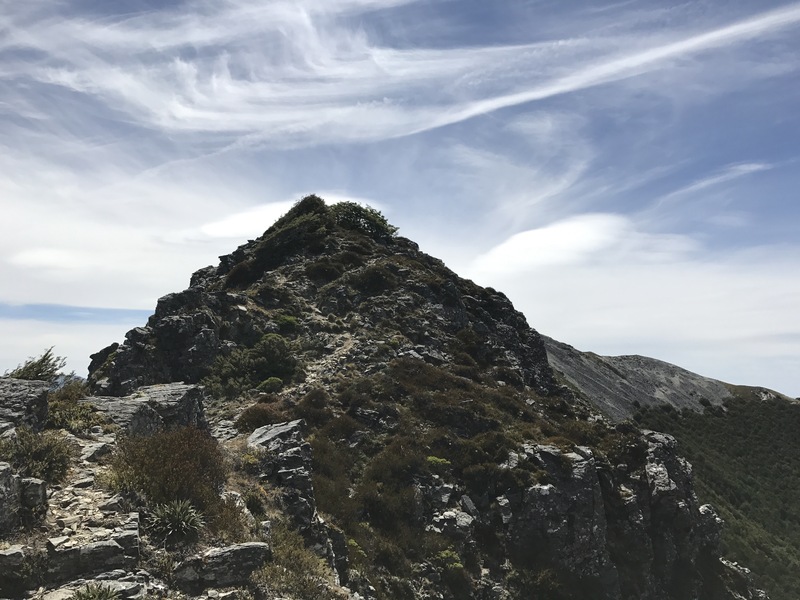 Having taken only three hours from Slaty, and given the skies were still pretty clear, we considered pushing on and over Mt. 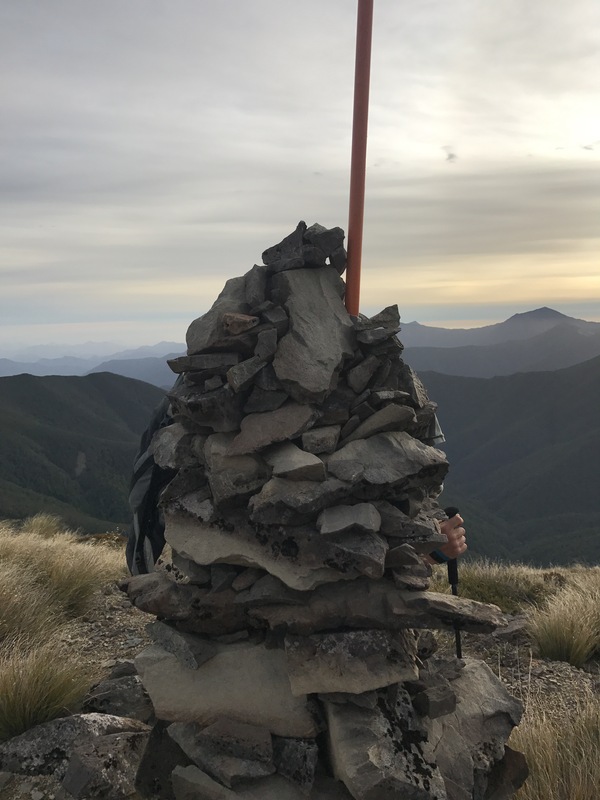 Rintoul (which will be the high point of the Richmond Range section), but decided in favor of staying behind the incoming weather and descending a couple hundred meters to the hut, and crossing over the summit tomorrow when it clears up. So our day complete by 12:30 when we arrived at this lovely hut in a clearing with views up the side of Little Rintoul, after a bummer of a downhill which was not easy on the knees and which we’ll have to ascend tomorrow, we got right to preparing lunch, of Italian flavor Pieter’s salami, spoonfuls of peanut butter, and handfuls of scroggin. Our afternoon consisted mainly of a bunch of games of hearts and planning the next couple days, punctuated by a voice calling for help in the woods, which turned out to be a goat. 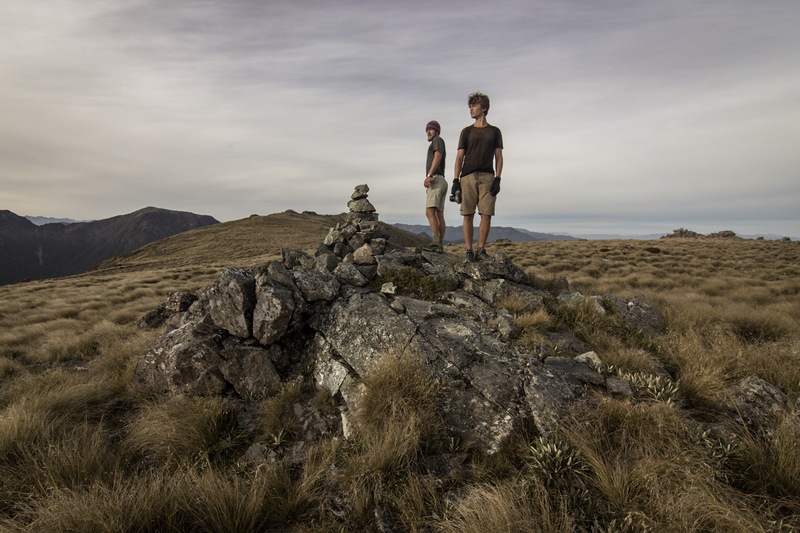 We were joined by two hikers, one of whom is camping outside the hut. By dinnertime (cheesy couscous and diced onion) it had gotten cloudy and windy enough that we were glad we weren’t up above the treeline, and by now some rain has started. We’re planning to sleep in a bit tomorrow and play our departure time by ear.